The Irish Rose - a Colorado Dream Vacation Spot - Secluded!! Please see the same 'Irish Rose' listing under Breckeridge--it has additional photos! Listing number is 13578. Completed in May 2002, this mountain cabin is located on the historic Mosquito Gulch Trail. 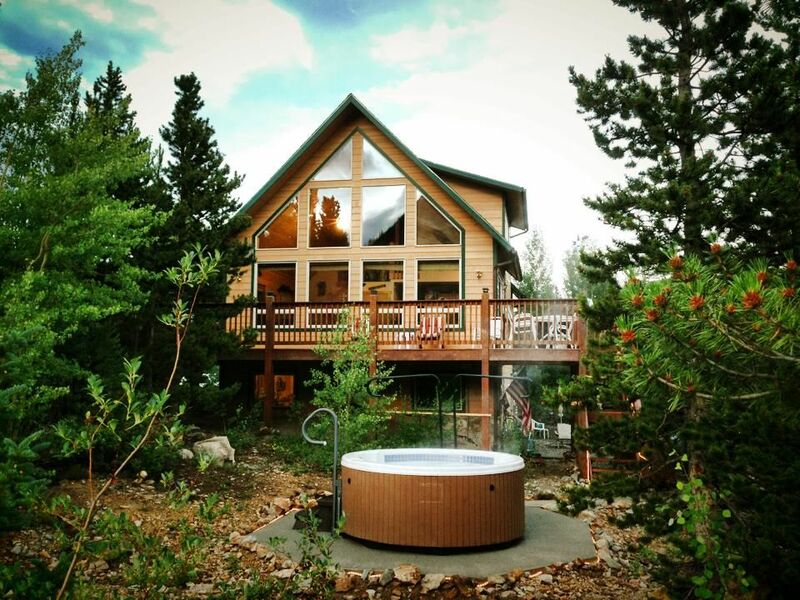 Just 15 miles south of Breckenridge, it is the perfect spot for either a secluded get-away or a ski vacation at a fraction of the cost. Gold pan on the local creeks, explore 'Buckskin Joe' trail, and visit the ghost town of Park City. The historic mining towns of Alma and Fairplay are also nearby. Mountain bike to your heart's content or drive the legendary 4x4 'Mosquito Pass' into Leadville. Pick wildflowers and view wildlife--there's something for everyone! The Irish Rose was built with families in mind. The main level has a great room with a gas fireplace and floor-to-ceiling windows showcasing the beautiful mountains and trees. It is surrounded by a huge 32 by eight foot wrap-around deck. A full kitchen and dining area are also on this level to create an open, spacious environment. Pets are NOT allowed, No Smoking. Experience the Rocky Mountains in the comfort of the 'Irish Rose.' At over 10,000 foot elevation, it's as close to heaven as you can get! We are a military family who built this home in 2002 and are blessed that we can share it with others! We have long ties to this part of Colorado. The Irish Rose feels wild and secluded but is close to Alma and Faiplay, and a short drive to the mountain ski town of Breckenridge. The Irish Rose has 10 acres of total seclusion with pine, aspen, a river, and amazing views. Many houses on the internet may look similar, but very few properties give you the total Colorado experience. Look at our guestbook and see that it will be a unique and memorable experience! Views of Pennsylvania and London Mountain, Mosquito Peak, and Mt Silverheels. No long distance calls. Must bring calling card. Cell service unreliable. Dining table seats six and bar has three bar stools.